Accepted: First, can you tell us a little about yourself? Where are you from? Where and what did you study as an undergrad? What’s your favorite flavor ice cream? Kendra: I’m from Hamlin, TX. I studied at McMurry University. I majored in BioMedical Science and minored in Biochemistry. My favorite flavor of ice cream is Vanilla Bluebell. I love to make coke floats! Kendra: I am a first year medical student at UT Houston Medical School. Accepted: What is your favorite thing about UT Houston so far? Which other med schools did you consider? Why did you choose UT Houston? Kendra: I love the sense of community that we have at our school. Even though we are one of the biggest classes in the US, we are able to embody one another as family. Other than UT Houston, I considered UTMB in Galveston. I chose UT Houston because the things that I stated above, set them apart from other schools. Kendra: I don’t think I would change anything! Some people have suggested a curriculum change, as we do use block scheduling, but in my opinion, when you come to medical school, you have to adapt to a certain system of study. 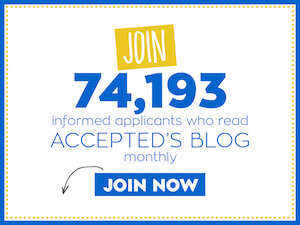 Accepted: In your blog you call yourself a professional procrastinator — how did you deal with this as a med school applicant and now as a busy medical student? Kendra: Obviously it played out in my favor, but I told myself as an applicant, I would never do that again. Procrastinating so much caused me so much headache that definitely could be avoided. Because I’m so used to procrastinating but still being able to succeed and get tasks done in a concise and efficient manner, I thought that that would translate over into medical school. It didn’t. First semester, I had such a hard time with trying to learn how to manage time, learning what study method worked for me, and all the while trying to keep up with material. It was not fun at all and procrastination finally caught up with me. Over Christmas break, I had to revamp how to approach studying, test-taking, and time management habits. I literally had to flip my life upside down to finally get it right. Accepted: Can you talk about your experience with taking an MCAT test prep course? Kendra: I used Kaplan as an online MCAT test prep course. I really didn’t know that much about it, but it was the only thing that I was ever advised to use. It didn’t work that well for me because I learn by actually sitting in a classroom and having structure to my studies. For others, it works great but for me it was a total waste because I knew before I paid all the money for it that online work didn’t work best for me. Kendra: There is no way that you can 100% prepare for medical school but there are a few things that you can do that will make things a lot easier. 1. Learn what study habits work best for you. When I came to medical school, I had no idea what worked best for me. I have since learned that pre-reading, as well as attending class, work best for me to reinforce and actually learn the material instead of just regurgitating information that has been thrown at me. 2. Make reading an integral part of your life. There are some things that just don’t come to you as easy as they do for other people. When a professor decides to move on and you still don’t understand a concept, it is up to you to go back and read resources to make the material a little more familiar. You have to be able to read AND comprehend your material. 3. Learn to not get so down on yourself early. This was one of my biggest problems in my first semester. I had a lot of trouble early on. Because people understood some information faster than I did, I automatically thought that I was behind. I was so used to doing great on everything in high school and college that it was a big shock that I didn’t make 90s and 100s on every, single thing. I became a little depressed and developed very heavy test anxiety (something that had never happened before). You have to realize when you come to medical school that you are part of a small group of people that are all the best of the best and the material is not always easy or fun. After I started having problems, everything went down from there because it was very hard for me to work at it. When I changed everything during winter break, I had to make an attitude change as well. 4. When you do get stressed out, find ways to de-stress!! Whether it’s just taking a night off from studying to binge watch Netflix, having a glass of wine with friends, volunteering, or just sleeping in one day, you’ll be thankful for it in the end. I personally like to volunteer every now and again to remind myself of why I got into medicine in the first place. With everything in just Gross Anatomy & Biochemistry, it is very easy to lose sight of why you’re here. Coming to medical school was a big change for me and it hasn’t always been easy, but these are some of the best years of your life so make the best of it and when you can, make it just a little bit easier. Accepted: Did you go straight from college to med school? Or did you take time off? Kendra: I graduated a semester early so I was able to have about 6 months off before the beginning of my entry year. During this time, I just spent time with family and worked to save a little bit of money before I had to completely stop working. Accepted: Looking back, what was the most challenging aspect of the med school admissions process? How did you approach that challenge and overcome it? Kendra: The most challenging part about the application process is that it takes a long time to get everything together and it’s very easy to give up on that. I realized this early on so I tried to keep accounts of things like volunteer experience, methods in the laboratory I learned, and extracurricular activities. I sort of kept a written account so I wouldn’t have to try to recount years of information to compile on one application. It helped a ton!! Accepted: Can you tell us about your blog and Twitter? Kendra: Although, these are both my personal accounts, I use them to show the more humorous side of medical school and medicine as well as give some advice. I’m not the conventional med student so I like to show students aspiring to follow this pathway that everyone does not follow it the exact same way. I hope it is inspirational, motivational, and helpful to people and I’m always open to answer questions about the application process, medical school, and medical school life. You can follow Kendra’s med school adventure by checking out her blog, Paging Student Dr. Kendra or by following her on Twitter (@studentdrkendra). Thank you Kendra for sharing your story with us! Last updated on March 25, 2015.